(1) Professor of Gastroenterology at the Universidad Nacional de Colombia and Gastroenterologist at Hospital El Tunal in Bogotá, Colombia. (2) Resident of Gastroenterology at the Universidad Nacional de Colombia and Gastroenterologist at Digestive Disease Center and Hospital El Tunal in Bogotá, Colombia. (3) Professor of Gastroenterology at the Universidad Nacional de Colombia and Gastroenterologist at Hospital El Tunal, Clínica Fundadores, and Clínica de la Mujer in Bogotá, Colombia. Diagnosis of choledocholithiasis is difficult because a clinical evaluation and blood tests are frequently insufficient for an exact diagnosis of choledocholithiasis. Patients often undergo ERCP which may be unnecessary but which generate high rates of morbidity and mortality. For this reason we decided to undertake this study to determine if the use of laboratory exams can predict choledocholithiasis to guide the decision to perform therapeutic ERCP. Patients and Methods: For this cross sectional observational study we chose a study population of all elderly patients who were undergoing ERCP on suspicion of choledocholithiasis. Logistic regression analysis was used to establish the degree of association between predictive variables. Choledocholithiasis diagnosed by ERCP was our independent variable while the dependent variables were age, gender, jaundice, pain, presence of cholelithiasis diagnosed ultrasound, presence of choledocholithiasis diagnosed ultrasound, total bilirubin count, direct bilirubin count, of direct bilirubin count over 30% of total bilirubin, AST, ALT, and alkaline phosphatase. We obtain the odds ratios (ORs) for prevalence. Our model for multivariate analysis took into account those values that were statistically significant in the construction of 2x2 tables. Results: Of the 120 patients included in the study, 84 were women (70%). The average age was 58 years, and patients ages ranged from 18 to 75 years. Choledocholithiasis was found in 83 patients (69.17%), dilated bile ducts in 84 (70%). The presence of dilatation and/or gallstones was found in 96 patients (80%). The bivariate analysis found that age (> 55 years), jaundice, elevated total bilirubin, elevated direct bilirubin, ALT 2, AST 2 and direct bilirubin greater than 30% of total bilirubin had statistical significance due to their relation to dilation of the common bile duct diagnosed by ERCP. Multivariate logistic regression of these factors found that people over 55 years of age are 5.19 times more likely to be diagnosed with choledocholithiasis by ERCP than younger patients, patients with elevated direct bilirubin are 4.98 times more likely to be diagnosed with choledocholithiasis by ERCP than patients without elevated direct bilirubin, and patients with direct bilirubin greater than 30% of total bilirubin are 9.73 times more likely to be diagnosed with choledocholithiasis by ERCP than patients with lower ratios. These three factors were the only independent predictors of choledocholithiasis diagnosed by ERCP found in the multivariate logistic regression. Conclusion: Based on the findings of this study we conclude that for patients with cholelithiasis direct bilirubin greater than 30% of total bilirubin indicates a probability 9.7 times greater for choledocholithiasis than for patients with a lower ratio, and 43 times greater that they will have a positive ERPC finding for choledocholithiasis and/or a dilated bile duct. The probability increases further if the patient is older than 55 years with the odds ratio reaching 11.3. In these cases performance of ERCP is indicated. Cholelithiasis is a very common disease affecting approximately 15% of the population in Europe and North America (1). 5% to 20% of these cases develop the complication of choledocholithiasis which is defined as the presence of stones in the common bile duct (1, 2). Choledocholithiasis is found in 8% to 18% of all patients with symptomatic cholelithiasis (2) and in at least 3% to 10% of patients who undergo cholecystectomies (3). Today, consensus exists that calculi in the common bile duct should be removed regardless of a patients symptoms since they can produce pain and also cause pancreatitis and/or cholangitis (4). Clinically, biliary obstruction can have the three following scenarios (5). First, patients can be considered for surgical treatment because of clinical symptoms and ultrasound findings suggesting biliary obstruction. Second, patients acute symptoms may resolve spontaneously, but then be followed by abdominal pain, jaundice and fever irrespective of simultaneous alterations in liver profiles. Third, patients may develop acute cholangitis or acute pancreatitis. Individual patient management by the specialist depends on the circumstances, but includes option such as endoscopic sphincterotomy with endoscopic retrograde cholangiopancreatography (ERCP) and intraoperative cholangiography (IOC) and open or laparoscopic choledochotomy. Notwithstanding the therapeutic options available, in many circumstances diagnosis of choledocholithiasis is not easy (6) since clinical evaluation and blood tests are frequently insufficient for an exact diagnosis of choledocholithiasis. Imaging, which can be invasive or noninvasive, is often necessary. Invasive methods include ERCP and IOC while noninvasive methods include hepatobiliary ultrasound, magnetic resonance cholangiography and endoscopic ultrasound. Because of its risks, ERCP is considered to be a primarily therapeutic procedure which is indicated when other noninvasive tests have identified biliopancreatic pathologies or, as in this case, choledocholithiasis. This procedures morbidity rate ranges from 3% to 6.4 % while its mortality rate ranges from 0.05% to 0.1% (7). When sphincterotomies are performed, these rates increase to 5% to 10% and 1% to 3.1% respectively (8). Taking these risks into account, patients for ERCP should be carefully selected using guidelines classifying them with high, medium or low probabilities of choledocholithiasis (9). Variables used for patient classification are age over 55 years, elevation of total bilirubin greater than 30 mg%, bile duct dilatation diagnosed by ultrasound and identification of common bile duct stones. If all four conditions are present, the probability of choledocholithiasis is 94%. Probability varies from 58% to 94% according to combinations of variables present, but is still 8% when all of these variables are absent. Although magnetic resonance cholangiography and biliopancreatic endosonography are sensitive and specific tests for determining the existence of choledocholithiasis, they are very expensive and are not available at every institution. Consequently, we have decided to focus this article on the use of simple and easy laboratory examinations that can be combined with abdominal ultrasound to predict the presence of choledocholithiasis and guide the decision about whether or not to perform therapeutic ERCP. We performed a cross sectional observational study between January and December 2010 in the gastroenterology service at Hospital El Tunal in Bogota D.C. The study population chosen included all patients over 18 years of age who came to the urgent care clinic and who underwent ERCP for suspected choledocholithiasis. All patients who underwent this procedure during this period and who were duly recorded in the Hospitals data base were included in the study. Preliminary data were collected immediately on arrival of patient and initiation paraclinical testing was done on the same day prior to the endoscopic procedure. Endoscopic data were gathered by a properly trained and qualified physician who was participating in the study. Information collected was recorded in a data collection instrument developed for this purpose. Data entry required more than 10 minutes per patient. Data were entered in a form or table which was filled in completely according to the methodology previously presented. This chart included all patients over 18 years of age who were referred for ERPC and who were able to have hepatobiliary ultrasound and liver function tests on the same day prior to the procedure. Complete gathering and recording of the data also included the following: A form was filled out for each patient referred for ERCP with a preliminary diagnosis of choledocholithiasis asking for her or his age, gender, clinical presentation, laboratory test results and ultrasound findings. Laboratory test results included transaminases, bilirubin, alkaline phosphatase, protein, prothrombin time, amylase, lactic dehydrogenase, and leukocytes while ultrasound findings included bile duct diameter and presence of stones in the gall bladder and/or bile duct. After a patient was admitted to the gastroenterology service, but before being transferred to the radiology service for ERCP, the following laboratory tests were performed: transaminases (AST, ALT), total bilirubin, direct bilirubin, alkaline phosphatase, complete blood count (leukocytes and hemoglobin), trans-abdominal ultrasound (liver, bile), and a hepatobiliary scan. Then the patient was moved to the fluoroscopy room where he or she underwent ERCP. Technicians and physicians who performed ultrasonography and laboratory tests did not know the results of tests they did not perform themselves. The data recorded on the form were entered into an Excel 2007 worksheet which was then loaded into STATA IC licensed version 10.0 statistical package for analysis. - We used the usual measures of descriptive statistics and frequency distribution and percentages were calculated for qualitative variables. - Bivariate analysis was used to relate dependent variables to predictor variables through the construction of contingency tables. Results were analyzed with Pearson chi-square test. Statistical significance was considered to be p <0.05. When frequencies of some cells were less than five, results were analyzed with Fishers exact test. - We used logistic regression analysis to obtain the odds ratio (OR) of prevalence to establish the degree of association between predictor variables and dependent variables. Predictor variables included choledocholithiasis diagnosed by ERCP, dilated bile ducts diagnosed by ERCP and the sum of these two giving the alteration variable of ERCP. 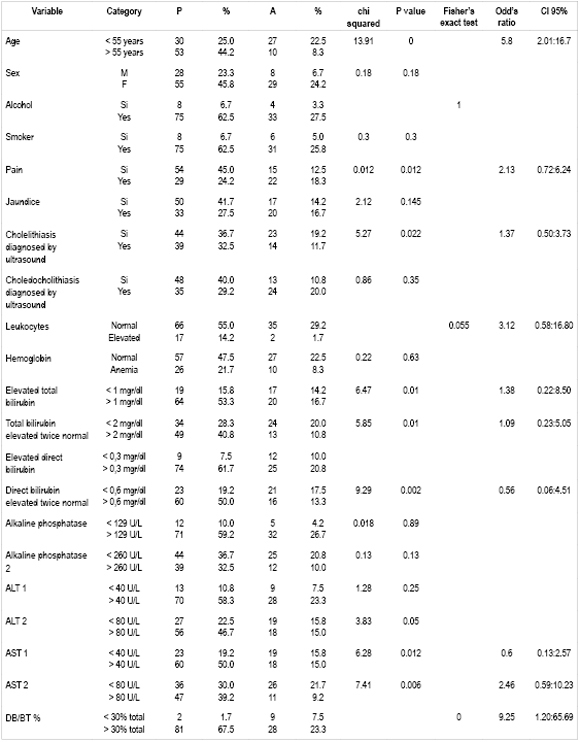 Dependent variables included age, gender, jaundice, pain, presence of cholelithiasis diagnosed by ultrasound, the presence of choledocholithiasis diagnosed by ultrasound, total bilirubin counts, direct bilirubin counts , ratio over of direct bilirubin to total bilirubin over 30%, AST, ALT, and alkaline phosphatase. For modeling the multivariate analysis we took into account those values that were statistically significant in the construction of the 2x2 tables and the predictor variables which were clinically relevant for this research (choledocholithiasis diagnosed by ERCP, biliary dilatation diagnosed by ERCP and changes in ERCP). In accordance with Resolution 8430 of 1993, this research is classifiable as an investigation without risk because of its nature and methodological characteristics. This type of research does not require informed consent forms from participating patients. The researcher agrees to keep the results and databases strictly confidential, and the custodian of patient information is subject to the provisions of Resolution 1715 of 2005, Act 23 of 1981 and resolution 1995 of 199. During the study period, 162 patients underwent ERCP. 120 of these patients met the inclusion criteria and constituted the final study population. Five patients were excluded because of decompensated cardiopulmonary disease, 15 patients because their laboratory test results were not complete within 24 hours of performance of ERCP, four patients because of prior ERCPs, 9 patients because of failed ERCPs, five patients because of biliary tract cancer, and four patients because of pancreatic head cancer. 84 of the 120 patients (70%) were women, average patient age was 58 years, and patient age range was 18 to 75 years. Choledocholithiasis was found in 83 patients (69.17%), dilated common bile ducts in 84 patients (70%), and the presence of dilation and/or calculi was found in 96 patients (80%). 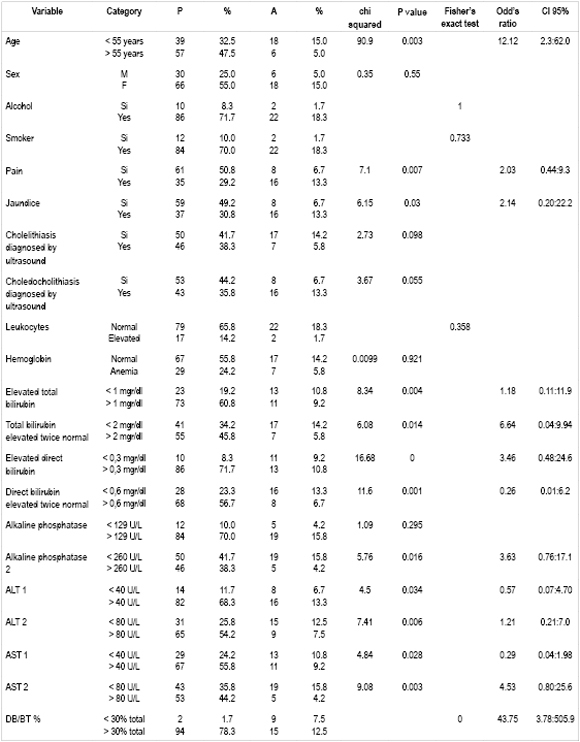 Table 1 show frequencies and percentages of all factors analyzed for all patients. Tables 2, 3 and 4 show predictors (choledocholithiasis found during ERCP, dilated bile duct by found during ERCP and ERCP abnormalities) combined with different dependent variables. Table 2. Degree of association of independent variables of interest with choledocholithiasis found by ERCP. Table 3. Degree of Association of Independent Variables of Interest with Changes Introduced by ERCP. Table 4. Degree of association of independent variables of interest with dilation of bile duct. Cross referencing dependent variables and predictor variables in bivariate analysis (2x2 Tables) produced three comparative tables. Table 3 shows the results of bivariate analysis relating choledocholithiasis diagnosed by ERCP, a dependent variable, with the following statistically significant variables: ages over 55 years, pain, cholelithiasis diagnosed by ultrasound, total bilirubin over twice normal levels, elevated AST, direct bilirubin levels more than 30% higher than total bilirubin (hyperbilirubinemia). Multivariate analysis and logistic regression found that predictors of choledocholithiasis were age over 55 years (OR 5.8 IC95% 2.01:16.7) and direct bilirubin greater than 30% of total bilirubin (OR 9.25 IC95% 1.20:65.69). Bivariate analysis of all patients (Table 4) comparing the dependent variable "Alterations due to ERCP" found that age (> 55 years), pain, jaundice, elevated total bilirubin above the cutoff point, total bilirubin twice normal value, elevated direct bilirubin, direct bilirubin elevated two times above normal value, alkaline phosphatase level twice normal maximum value, ALT elevation, ALT 2 elevation, AST elevation, AST 2 elevation and direct bilirubin to total bilirubin ratio greater than 30% were statistically significant. All of these are related to the presence of choledocholithiasis and/or dilation of the common bile duct due to ERCP. Multivariate logistic regression analysis of all these factors found that ages over 55 years and ratios of direct bilirubin to total bilirubin greater than 30% were independent predictors of choledocholithiasis and dilation of the common bile duct due to ERCP with estimated risks of 12.12 times and 43.75 times respectively. Bivariate analysis of all patients (Table 4) comparing the dependent variable "common bile duct dilated by ERCP" with other variables found that ages over 55 years, jaundice, total bilirubin elevated beyond cutoff point, elevated direct bilirubin, direct bilirubin 2 high, 2 ALT, AST 2 and direct bilirubin greater than 30% of the total were statistically significant. All are related to the bile ducts dilated by ERCP. 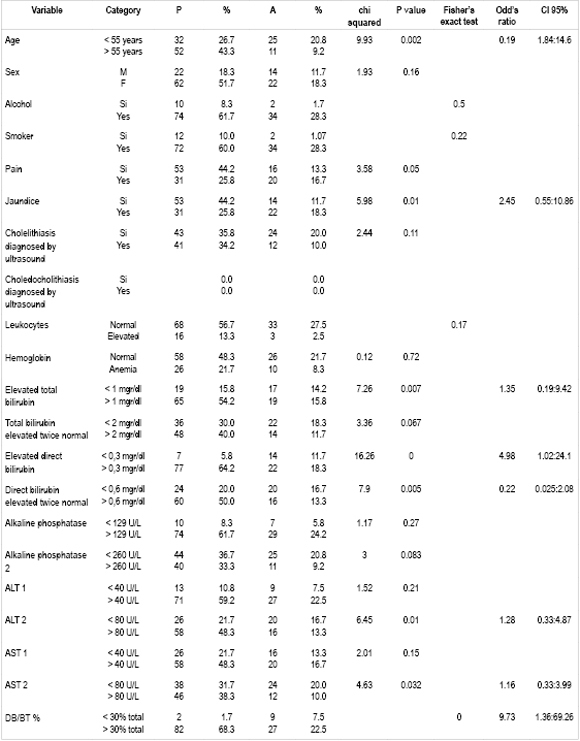 Multivariate logistic regression analysis of all these factors that age ages over 55 years, elevated direct bilirubin and direct bilirubin greater than 30% of total bilirubin were independent predictors of choledocholithiasis found by ERCP with estimated risks of 5.19 times, 4.98 times and 9.73 times respectively. Choledocholithiasis is present in 5% to 20% of patients who undergo cholecystectomies. Incidence increases as age increases. Its detection is essential so that it can be managed to avoid potential complications of acute biliary pancreatitis or cholangitis which can be fatal (2). Although ERCP is the ideal treatment for choledocholithiasis, it has high rates of morbidity and mortality. Consequently, prior to performing this procedure the physician must make sure that the patient does in fact have choledocholithiasis so that the procedure, and the risk of complications that it entails, will not be in vain (4). The literature has attempted to establish less invasive methods such as magnetic resonance cholangiography and endoscopic ultrasound for diagnosing the presence of choledocholithiasis in order to decide whether to refer patients for patient ERCP. Nevertheless, since these methods are costly and rarely available in our environment, different strategies which use widely available laboratory test results need to be developed. In this study we evaluated the performance of a combination of liver function tests and abdominal ultrasound to detect choledocholithiasis. We found that the overall prevalence of choledocholithiasis in patients who underwent ERCP because choledocholithiasis had been suspected was 69.1%. This percentage is higher than the 40.2 % prevalence found in a study by Dr. Clare and colleagues (10). This difference is probably because our patients had to meet rigorous selection criteria. An analysis all patient variables in relation to presence of choledocholithiasis, dilated common bile ducts, and choledocholithiasis found during performance of ERCP determined that predictor variables (p <0.05) include age over 55 years, elevated total bilirubin, elevated direct bilirubin, direct bilirubin elevated above two times the cutoff point, AST elevated two times above the cutoff point and direct bilirubin to total bilirubin ratios greater than 30%. Logistic regression analysis showed that age greater than 55 years increased the probability of choledocholithiasis by 5.8 times (95% CI 2.01 to 16.7), increased the probability of common bile duct dilation 5.19 times (95% CI 1.84 to 14.6), and increased the probability of positive findings for choledocholithiasis during performance of ERCP to 12.1 (95% CI 2.3 to 62). Age and choledocholithiasis are correlated because there is a linear increase in the incidence of choledocholithiasis as age increases. The 55 year limit we used is based on other studies published internationally such as the research of Barkun and colleagues (9) and that of de Menezes and colleagues (11) which confirm that this variable is useful and should be taken into account when we suspect the presence of choledocholithiasis. Total serum bilirubin has been consistently identified as a significant predictor by various Colombian and international studies including those conducted at Rafael Uribe Uribe Hospital in Cali in 2000 (12). That study used a cutoff point above 3.5 g/dl (13) whereas as Barkuns cutoff point was 3 g/dl (9). Our study also showed a statistically significant relation (p = 0.01) between total serum bilirubin levels and the diagnosis of choledocholithiasis by ERCP. Still, the most statistically significant and useful predictor found in our study was a ratio of direct bilirubin to total bilirubin greater than 30%. The presence of this predictor increased the probability of choledocholithiasis by 9.25 times (95% CI 1.20 to 65.69) and increased the probability of common bile duct dilation by 9.73 times (95% CI 1.36 to 69.26). The likelihood that one or the other of these two would be found during performance of ERCP increased to 43.7 times (95% CI 3.78 to 505.9). Our review of the literature showed that this parameter had not been evaluated before. We believe that examination of this parameter is the main contribution of this study, especially since its presence successfully predicted choledocholithiasis during ERCP even in some patients with total bilirubin less than 3 g/dl. It should be noted that, although our main objective was to study choledocholithiasis found during ERCP, we also looked at dilation of the bile duct when gallstones were not present. This topic was included because the bile duct could have become dilated as the result of a gall stone too small to be observed during performance of ERCP or because of a gallstone which had already migrated by the time ERCP was performed. This supports the opinion that when choledocholithiasis is suspected and a dilated bile duct is found without the presence of visible calculi, a papillotomy and bile duct exploration with basket should be preformed. On the other hand, unlike other studies our study found a poor correlation between diagnosis of the presence of choledocholithiasis and cholelithiasis by ultrasound and ERCP findings (p = 0.35). This contrasts with the study Barkun and colleagues (9) in which a correlation was found between the presence of choledocholithiasis and the presence of stones found by ERCP (p = 0.02). This may be because of an operator-dependent bias in imaging which was done by a variety of professionals. It should be kept in mind that various studies show that biochemical tests and imaging are valid if performed within the 10 days prior to ERCP (15, 16) while other studies suggest that these tests should be performed within two days of ERCP performance (17). Our experience shows that even two days are excessive. Patients should be reassessed on a daily basis when deciding whether or not to perform ERCP because in 3% to 14% of cases calculi spontaneously migrate to the duodenum. In theory, in these cases patients no longer need ERCP (12). Therefore, in our research we evaluated biochemical parameters on the same day and within a maximum of 4 hours of performance of an ERCP because we needed to know the current status of the patient before proceeding with the procedure. Based on the findings of this study, we can conclude work that when a patient with cholelithiasis has a ratio of direct bilirubin to total bilirubin greater than 30%, there is a 9.7 times greater probability of choledocholithiasis and a 43 times greater probability of finding either choledocholithiasis and/or a dilated bile duct. When the patient is also over 55 years old odds ratio increases to 11.3. In these cases performance of ERCP is indicated. However, when these parameters are absent it is necessary to evaluate the common bile duct by a noninvasive method to confirm or rule out choledocholithiasis and avoid performance of ERCP since it entails a high risk of morbidity and mortality for the patient. 1. Mitchell, SE, Clark, RA. A comparison of computed tomography and sonography in choledocholithiasis. AJR Am J Roentgenol 1984; 142: 729-734. 2. Ko CW, Lee SP. Epidemiology and natural history of common bile duct stones and prediction of disease. Gastrointest Endosc 2002; 56: S165-9. 3. Freitas ML, Bell RL, Duffy AJ. Choledocholithiasis: evolving standards for diagnosis and management. World J Gastroenterol 2006; 12: 3162-7. 4. Attasaranya S, Fogel EL, Lehman GA. Choledocholithiasis, ascending cholangitis, and gallstone pancreatitis. Med Clin North Am 2008; 92: 925-60. 5. Frederic Prat, Bruno Meduri, Beatrice Ducot Renaud Chiche, Roberto Salimbeni-Bartolini, Gilles Pelletiert. Prediction of Common Bile Duct Stones by Noninvasive Tests. Ann Sur 1999; 229: 362-368. 6. Eisen G, Dominitz J, Faigel D, Goldstein J, Kalloo A, Petersen B, et al. An annotated algorithm for the evaluation of choledocholithiasis. Gastrointestinal Endosc 2001; 53: 864-866. 7. Kyo-Sang Y, Glen AL. Endoscopic management of biliary ductal stones. Gastroenterol Clin N Am 2010; 39: 209-227. 8. Freeman ML, Nelson DB, Sherman S, et al. Complications of endoscopic biliary sphincterotomy. N Engl J Med 1996; 335: 909-18. 9. Barkun A, Barkun J, Fried G, et al. Useful predictors of bile duct stones in patients undergoing laparoscopic cholecystectomy. Annals of Sug 1994; 1: 32-39. 10. Claros N, Laguna R, Ponce R, Feraudy I. ¿Cuál es la prevalencia de litiasis de la vía biliar principal en pacientes con colecistolitiasis sintomática? Rev Chilena de Cirugía 2007; 59: 127-131. 11. Menezes N, Marson L, Debeaux A, Miur I, Auld C. Prospective analysis of a scoring system to predict choledocholithiasis. Br J Surg 2000; 87: 1176-1181. 12. Bejarano M. Utilidad de los factores predictores de coledocolitiasis en pacientes operados en la clínica Rafael Uribe, Cali 2000. Rev Colomb Cir 2003; 18: 33. 13. Zidi, SH, Prat, F, Le Guen, O, et al. Use of magnetic resonance cholangiography in the diagnosis of choledocholithiasis: prospective comparison with a reference imaging method. Gut 1999; 44: 118. 14. Parra V, Vargas G, Astete M, Valdivia M, Moran L, Núñez N. Predictores de coledocolitiasis en población de alto riesgo sometida a pancreatocolangiografía retrógrada endoscópica en el Hospital Loayza. Rev Gastroenterol Perú 2007; 27: 161-171. 15. Nataly Y, Merrie A, Stewart I. Selective use of preoperative endoscopic retrograde cholangiopancreatography in the era of laparoscopic cholecystectomy. ANZ J Surg 2002; 72: 186-189. 16. Mateo M. Litiasis de la vía biliar principal. Diagnóstico y tratamiento observados en el Hospital Dos de Mayo (Tesis). Lima: UNMSM; 1996. 17. Einstein, DM, Lapin, SA, Ralls, PW, Halls, JM. The insensitivity of sonography in the detection of choledocholithiasis. AJR Am J Roentgenol 1984; 142: 725.